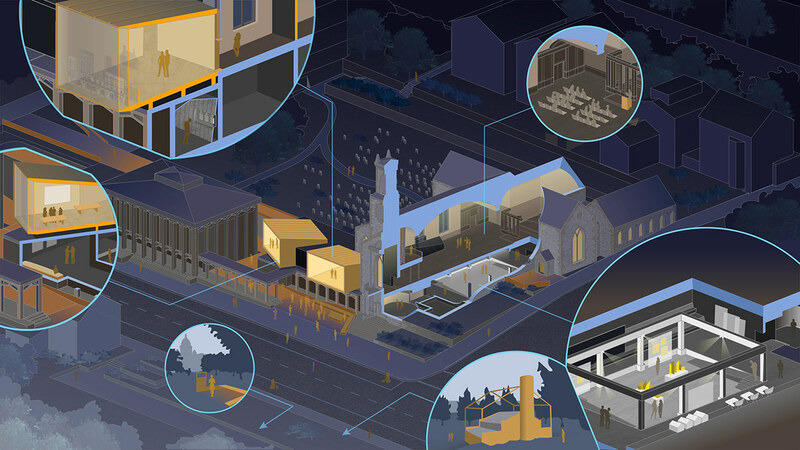 Changing modes of participation in faith communities in the United States has led to the increasing abandonment of religious buildings, as well as a need for congregations to share space with new programs in order to remain sustainable. These two projects investigate how two Rhode Island congregations seeking to share their spaces with new programs could potentially reuse their church buildings as museum spaces: one dedicated to uncovering the work of an overshadowed artist and another aimed at reconciling Rhode Island's role in the slave trade. The Newport Congregational Church contains stained-glass artist John La Farge's only complete interior. Here, a soft intervention consists of a single gallery wall that winds sensitively through La Farge's murals and windows, creating a curated path through the national historic landmark. Meanwhile, the mission of the Center for Reconciliation-an organization dedicated to retelling Rhode Island's relationship to slavery and its contemporary legacy-requires a more drastic architectural intervention in its host structure, Providence's Cathedral of Saint John. 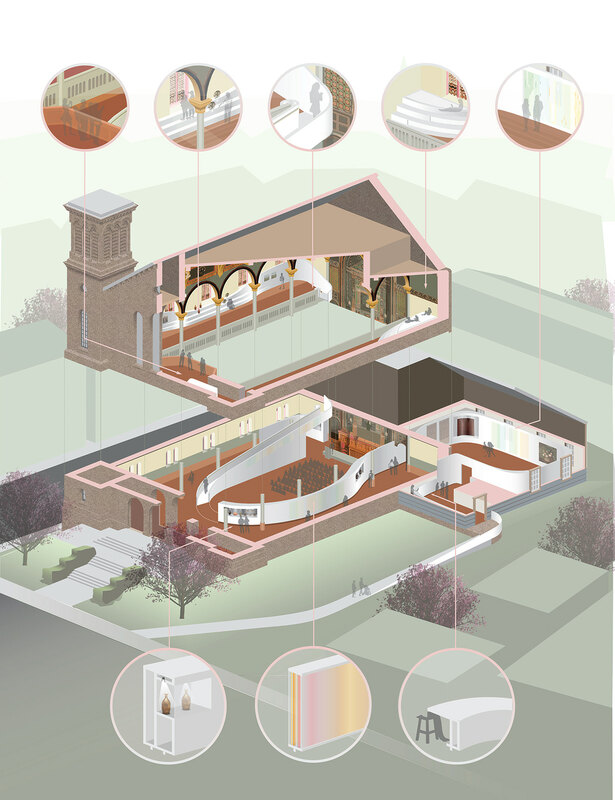 In this proposal, the Center's museum spaces fill the undercroft of the church before breaking through the sanctuary floor, emerging into galleries that force the visitor to survey the expanse of land adjacent to the church on which Providence's African American communities experienced centuries of demolitions and displacements. 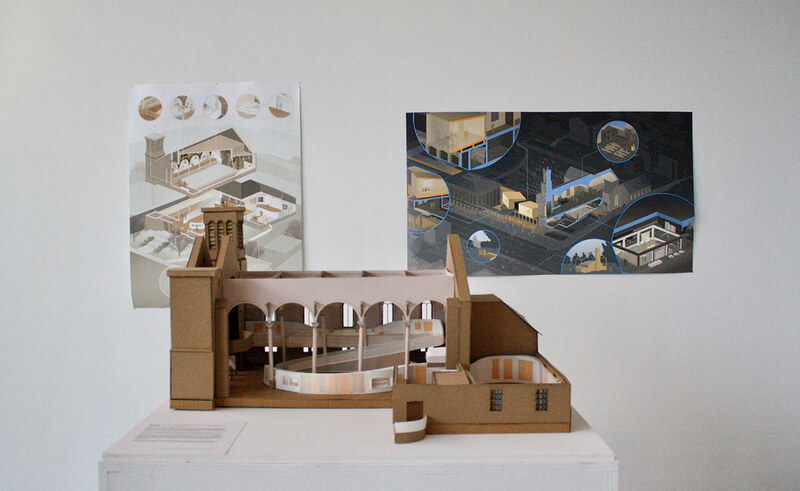 These two projects speak to the parallels and divergences of projects involving public memory: the secular v. the sacred, historic v. contemporary, centrality v. marginalization, transnational issues v. local specificities, art v. history, and the intersecting, yet often conflicting, retellings of the past.